Thank You for being a loyal Fitness First Member! 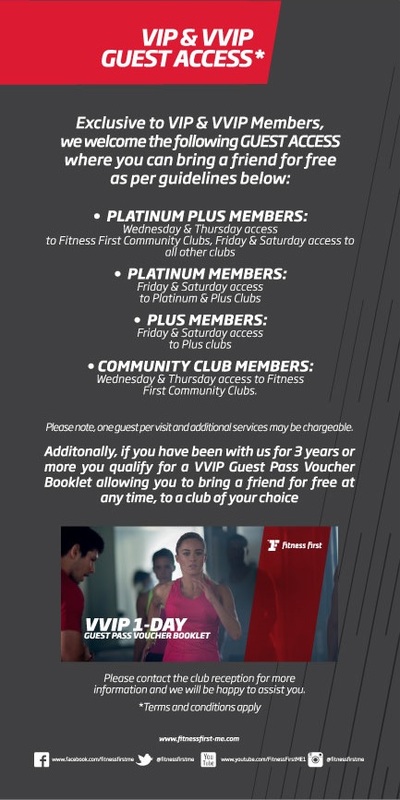 As a loyal Fitness First member, you deserve to be recognized and rewarded. To show our appreciation, we would like to invite you to be a part of our exclusive VIP and VVIP Privilege Program. This is for our elite Fitness First members who have been with us continuously for 1 year or more and is accredited at renewal. As a VIP and VVIP membership card holder, you are part of our exclusive Bring a Friend benefit so that you can both enjoy the club and the benefits of working out together. We found that working out together helps you achieve better results, so we hope that you will take advantage of this benefit! Apart from that, from time to time, you will also be entitled to rewards, incentives and discounts from us and our partners, so watch out for it! The longer you stay, the more rewards and benefits you will enjoy!